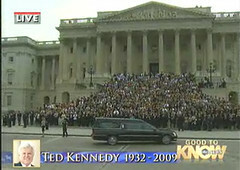 6:00 pm ET: A large crowd of staffers and others is assembled at the Capitol awaiting the casket of Senator Edward Kennedy which is en route from Andrews Air Force Base. The procession will drive around the Lincoln Memorial and the Capitol and then proceed to Arlington, where Senator Kennedy will be laid to rest. ABC News reports there are 900 staff on the steps and 4,000 in the plaza and lining Constitution Ave. You can follow on Twitter here. The official Edward M. Kennedy page with updates is here. Caroline Kennedy's tribute to Teddy Kennedy at tonight's memorial service in Boston was my personal favorite. 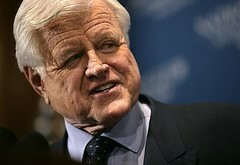 The New York Times recounts Senator Ted Kennedy's final days and how he coped with his illness. It's both sad and inspirational. President Obama has issued an executive order that flags be flown at half-mast until Sunday. What's next? Sen. Kennedy will lie in repose Thursday and Friday at the JFK presidential library. His funeral will be Saturday at Our Lady of Perpetual Help in Boston. President Obama will deliver a eulogy. He will then be buried at Arlington next to his brothers. Senator Edward (Ted) Kennedy passed away last night at his home in Hyanis Port. He was 77.